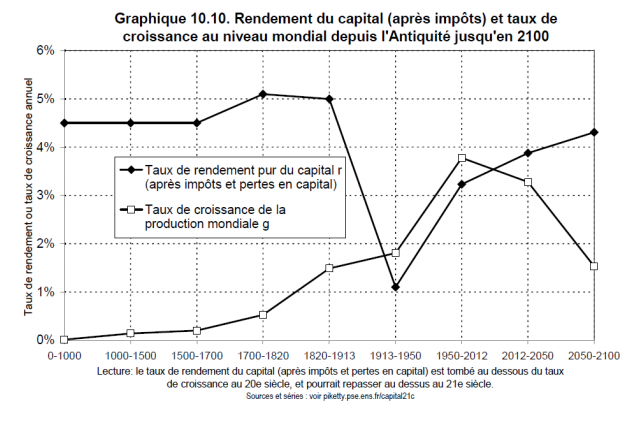 IMPORTANT UPDATE: My friend David Laibman, whose book Capitalist Macrodynamics anticipated some of these novel claims, just made me see an egregious misunderstanding on my part: Piketty’s claim, of course, is not that r is growing faster than g_Y, but only that r (the level of the profit rate, not its growth rate) is greater than g_Y, which is entirely possible as K/Y goes up. In Marxian terms, \beta = K/Y, which is a way of representing the composition of capital, \alpha is a measure of the rate of exploitation. So clearly, r > g_Y even if K/Y goes up, as long as \alpha increases. I stand corrected!